Canada Geese like to land on water, though sometimes they will land on ice, snow, or grass, if necessary. They never even try to land on twigs, as sparrows do. They're too big for that, and webbed feet aren't much good for gripping twigs. Canada Geese do some things well, and others less well. Somehow they know what works for them and what doesn't. They stick with what they do well. For goose or gander, a twig landing might be the last dumb move it makes. Unlike geese, companies sometimes tackle projects that they have no hope of completing successfully. So there's always a chance that your project is wrong for your company. How can you tell if your company is a goose trying to land on a twig? Here are five factors that can keep a project from being the last dumb move your company makes. Canada Geese. Photo by Glen Smart, courtesy U.S. Fish and Wildlife Service. Flocks of geese know their territory pretty well. They know from experience where to find food and shelter. Make sure that your project is like something your company has done before. If it's a radical departure, keep it small. Goslings spend their first summer of life learning from their elders how to be geese. They train hard until they know what they need to survive. Use your experienced people as mentors. Have them show the others, and use every project as an opportunity to transfer skills and to practice. If you don't have enough experienced people, hire more. If a goose did try to land on a twig, it couldn't hold on. It would fall, and it might break a wing or leg. Geese don't try to land on twigs. If you don't successfully complete your project, failure shouldn't threaten the existence of the enterprise. A bet-the-ranch proposition is a bad bet. Geese stay in a place as long as it meets their needs. When it gets too cold or too hard to find food, they move on. Even though a project is compatible with what your company has done before, it can still be a mistake if the marketplace has moved on and left the company behind. Geese are large, in part, because they eat leaves and grass and have to process lots of food. If a goose wanted to land on twigs, it would have to be small, which would require a change of diet and lots of evolution. "Stretch" projects can help adapt a company to changing markets. But choose stretch projects wisely. A project that's inherently incompatible with what the company already does well isn't a "stretch" project — it's a "break" project. 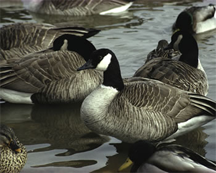 For more about Canada Geese, visit the Web site of the US Fish and Wildlife Service Horicon National Wildlife Refuge or the Stillwater National Wildlife Refuge Complex. Would you like to see your comments posted here? rbrenVQeXwOKnmZuuEnXnner@ChacvVpsuzZCsiVbXdEIoCanyon.comSend me your comments by email, or by Web form. I offer email and telephone coaching at both corporate and individual rates. Contact Rick for details at rbrenuHGOiSxKILfKPbncner@ChacXCktUcHkvUZPisTioCanyon.com or (650) 787-6475, or toll-free in the continental US at (866) 378-5470.